If you love camping but not the idea of living with creatures roaming around or looking for a bathroom in the bush at 2 a.m, you may consider going glamping. Glamping is simply camping with a little bit of glamour. No need to carry your sleeping bags and tents. There’s this new trend in town that allows you to enjoy the outdoors with luxurious accommodation. After all, who says you have to be all gritty and rough in order to enjoy camping? 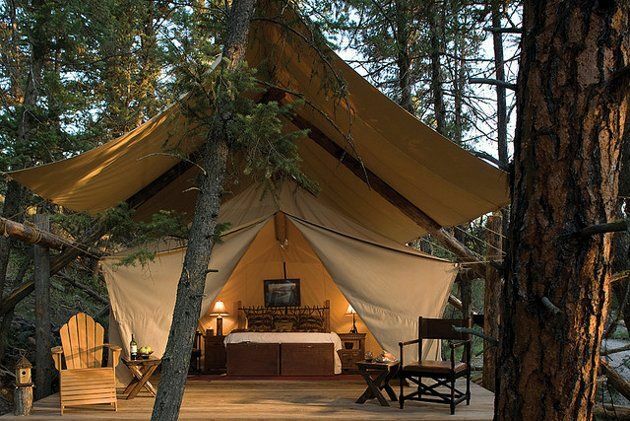 We’ll look at a few glamping hot spots in the US where you can enjoy a camping adventure with all the luxury required for a perfect retreat. Paws Up has been a favorite spot for glampers for a while now mainly because of the extensive activities offered such as guided tours, fly-fishing, shooting and hot-air balloon rides. It is situated in Greenough, Montana along the Blackfoot River. Campers can get to enjoy the luxurious bathrooms, laundry service, heated bathroom floors and spa treatments at the resort. However, their rates are not exactly for anyone’s budget. You don’t have to wait until you win the US Mega Millions jackpot, but you still have some savings to do. This is a glamping destination for lovers in search of a romantic getaway. There’s a high-end tent for the guests with quality furniture, air conditioning and heating and a traditional bath tub where you can relax. The campsite is so secluded with only one tent on a five acre piece of land. On-site activities are quite limited like swimming and fishing but guests can visit the town of Wimberley just 6 miles away for more adventure. This is the perfect place to enjoy camping in the countryside. The camping site has beautiful scenery and you get the luxury of living in a ranch with Canvas cabin tents and all the luxurious amenities you need. There are 8 cabins in the Ranch: 4 are dedicated to couples and the other 4 are for families. The cabins designed for couples come with a king bed, cozy seating area and so much more. The family cabins have two rooms separated by a curtain with a king bed in one of the rooms and twin beds in the other. Camp Orenda is the place you go glamping when you want to run away for a retreat with your family. There so many activities to enjoy at the camp and the canvas tent cabins have all the amenities your family needs for a comfortable stay.